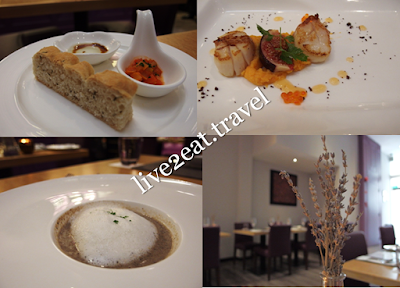 Singapore Restaurant Week was from 24 Oct to 1 Nov and my choice this time round was Violet Herbs, a new age semi-formal fine-dining restaurant offering European cuisine with Asian influences. Helmed by Chef Edward Hoe with about two decades of culinary experience, the restaurant has its own herb garden growing up to 20 different kinds of herbs. As the name suggests, herbs are used extensively in its dishes and splashes of violet – chairs and sofa seats stood out against wooden tables, floor and frames (of pictures on one wall and mirrors on another), could be seen on the first floor of the two storey shophouse on Tras Street. Visited last weekend and we had for appetiser, Parma Scallops and Mushroom Cappuccino with truffle foam and chives. The former was succulent and served with burnt figs on bland sweet potato purée, trout roe caviar and melon gel while the latter was strangely bitter. 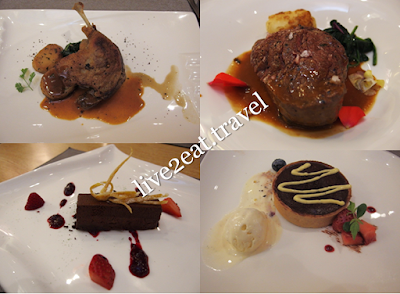 For the main course, my dining companion ordered Duck Confit (65 Degrees) in foie gras duck jus that was crispy on the outside and tender on the inside though I did not like the sautéed baby spinach and herb potatoes which it came with. Similarly for my Char Grilled Tenderloin (Grain Fed 120 Days) in cepes reduction, with potato fondant that reeked of rancid smell. After our disappointment with how the meal had turned out so far, we were not expecting much of its desserts. And maybe that was why we found both the Valrhona Chocolate Tart, and Chocolate and Banana Mousse to be surprisingly good. Crumbly tart filled with rich chocolate was balanced by the tart berries though my dining companion thought its texture was reminiscent of brownie. Loved the combination of chocolate and banana, and how it was not too cloying due to the mixed fruits compote. It was a lovely end to an otherwise unsatisfying dinner.